To assist you in planning your holiday in Nerja, we have put together a collection of information to help you get the most out of your stay. Use the menu on the left to access the full range of resources, which include suggestions for places you might like to visit during your holiday, as well as covering some of the practicalities associated with booking your holiday such as car hire, flights and airport parking. A short guide to Nerja and its main attractions. Nerja has no fewer than 10 beaches. Find out about them here. Download a detailed street map of the town of Nerja and the surrounding area. Discounted car hire from Malaga Airport and in the rest of Spain. Links to useful websites that help you find cheapest flights for your holiday. Nerja has a privileged location, sandwiched between the beautiful shoreline of the Mediterranean Sea, and the dramatic mountain range composed of the Sierras de Almijara, Tejeda and Alhama. To help you discover its beauty, we have put together a selection of self-guided walks in and around Nerja, ranging in length from 3km to 15km, and with differing levels of difficulty. All these walks have an accompanying pdf file with full description and photos which we make available free of charge to guests staying in our properties. These walks will introduce you to some of the most spectacular scenery in the mountains surrounding Nerja, with beautiful views of the coastline. In addition you will see how easy it is to get out of the town and into the countryside and mountains, with many of our walks starting from Capistrano Village meaning that a car is not necessary as the whole route can be done from your front door. Soon you will be out in the wild, where you may meet one or two other walkers, but apart from that you will have the landscape pretty much to yourself, along with a mountain goat or two if you are lucky. 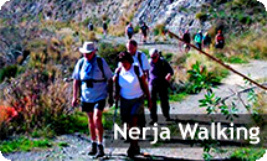 Find out more about our walks on our Nerja Walking website.